Every now and again, an article will surface about eminent domain and the “unjust” seizure of private property by the government. Framed as a classic David and Goliath case, these articles attempt to evoke sympathy for local victims who have little recourse against large government bodies, ultimately invoking debates about the role of government and the consequences of development and progress more broadly. Recently, I came across one of these articles, which focused on a local man, Joe, in Indiana whose farm was “destroyed” by a recent addition to a major highway, I-69. To clarify, his 80-acre farm was not destroyed; in fact, only a “chunk” was taken to be paved over. This portion, however, created a gap in the farm that affected the movement of his livestock as well as disrupted a drainage system used to prevent flooding. Since the addition, his farm has flooded several times, causing significant damage. Beyond these logistical concerns, the very construction of the highway itself produced a series of overwhelming blasts by construction workers that took place at night. For his wife, the stress became so unbearable that she had to move after having lived on this farm for more than half a century. For this couple and others affected by eminent domain more generally, there is a sense of injustice in not only losing their land to the government, which is theoretically supposed to protect their private property rights, but also losing their privacy. Because many projects only require a small portion, as with the case in question, the line between public and private space is blurred. Despite receiving ‘just’ compensation in accordance with the fifth amendment, there is something unsettling about the government coming in and taking their private land because they did not have the option to refuse. Furthermore, in the case of Joe, the new construction damaged the rest of his land. For those implicated in the process, the issue is extremely complex, as it not only plays on ideas of principal that question the very relationship between citizen and state. There is also an undeniable emotional aspect known as placidness, where land is not just a commodity to be bought and sold but instead a place where “individual and collective ties are deeply rooted, interdependent and interwined” (“Surving Madre Tierra”) in this physical location. With regards to property rights, the relationship between a citizen and state is complicated. While the government has a duty to protect private property through ownership rights, owning land is not enough in cases of eminent domain. As the landmark case 98 U.S. 403, 406 (1879) decided, “eminent domain appertains to every independent government. It requires no constitutional recognition; it is an attribute of sovereignty”. Since the government is taking land for public use, they bypass many of the technicalities of private property. In this way, eminent domain is somewhat utilitarian, where the goal is to create the greatest good for the greatest amount of people, despite the casualties of a select few. In another landmark case Kohl v. United States, 91 U.S. 367, 371 (1875), the appellants brought a case against the federal government and its attempt to seize land for the creation of a postal office and customs house in Cincinnati. Justice William Strong ultimately ruled that the “authority of the federal government to appropriate property for public uses was ‘essential to its independent existence and perpetuity.'”. Eminent domain cases have allowed for the expansion of federal buildings that house some of the most basic government services, the creation of transportation networks on which many individuals and businesses are dependent, national defense initiatives, national security installations, such as security at the southern border, recreational opportunities, historical preservation and environmental protection. Beyond practical and economic concerns, like the highway above, eminent domain has also allowed for the preservation of national historical sites as well as national parks that many citizens consider integral to the nation’s identity. In the future, eminent domain is likely to be at the forefront of environmental protection and sustainability issues. 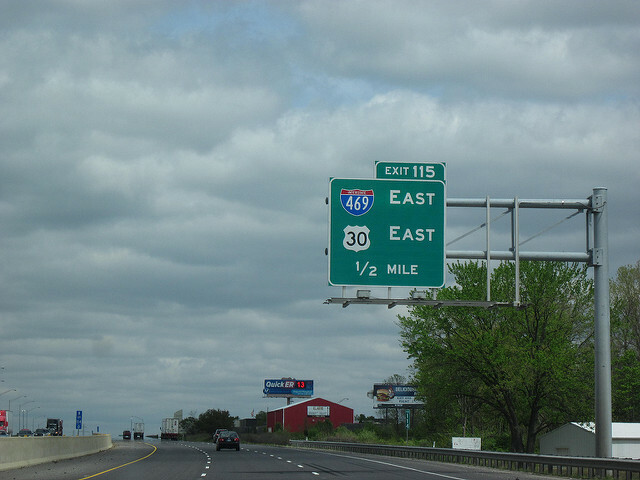 Returning to the case in question, the addition of this highway is part of a larger effort to merge State road 37 with the national highway I-64 in order to create a continual path between Mexico, the US and Canada. While most people reading this acknowledge the unfortunate circumstances of this event, from a utilitarian perspective, this road is part of a larger, global initiative that will ultimately benefit more people than it will harm. 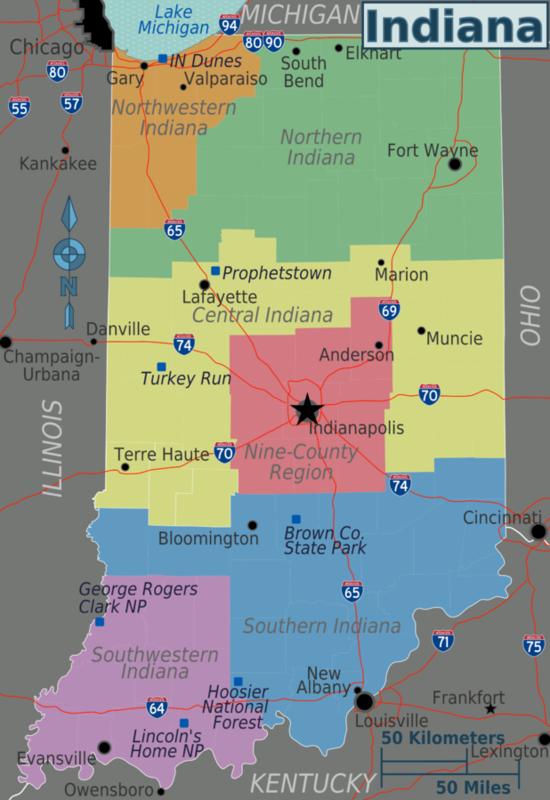 Joe’s farm is located in Southern Indiana, which is represented in blue on this map. Indiana because eminent domain is nothing new. The reality is that each year, eminent domain affects thousands of citizens, and these individuals forget that this land came from a similar process where it was taken from indigenous groups by the federal government. However, unlike Joe, they did not receive compensation. What makes this issue so complex is that unlike indigenous groups, people like Joe have agreed and even actively embrace the values and rules of US society, of which eminent domain has legal precedent. For indigenous groups, the argument is more nuanced and complex because they never agreed to the values and rules of US society nor were they even considered citizens for the longest of time. Consequently, their victimization is justifiable. For people like Joe, the same does not apply, at least within the current framework in which US society operates. This does not mean we cannot be sympathetic, nor should we ignore cases like his and disregard the serious ethical questions associated with these cases, but framing people like Joe as “helpless victims” when the evidence says otherwise is problematic and sends the wrong message, which is precisely why the article in question caught my attention. For the land owners of southern Indiana, such as Joe’s wife, this intervention is devastating, but the reality is that her relocation was voluntary and that in the end, most of her land was still intact. She did not lose her rights nor her ability to be on her land, and while the argument can be made that the quality of the land changed, she was compensated. Joe installing a sign that claims “another farm being destroyed by progress” may be useful for political rhetoric, but it is certainly not true. As mentioned, it was a relatively small portion that was affected. The article seems to be purposefully vague when describing the amount of land lost, describing it as “a chunk of the 80 acre farm“. The vagueness of the phrase in combination with other phrases like “Another farm destroyed for progress” is suspect and likely a gross exaggeration of the reality of the situation. In reading this article, language became a central focus, as certain words, such as “destroyed” and “progress”, not only began to stick out, but seemed to be purposefully vague. Both words are powerful buzzwords that are capable of not only instantly capturing public attention, but also influencing their opinion despite conveying no actual knowledge of the situation. The connotation of the word destroyed invokes a strong image; one where everything is demolished with very little of the original remaining intact. By this standard, Joe’s farm should be unrecognizable and completely paralyzed, which is not the case. The juxtaposition of the antithetical words destroyed and progress further complicate this reality. The word progress not only has a negative connotation that comes at a cost, but also comes to take on the definition of its antonym, destruction. Beyond language, the very structure of the article is more concerned with telling a story and invoking emotional support for the couple than necessarily talking about the issues and nuances of the story’s underlying concept, eminent domain. Opening with a pure call to pathos, “Joseph Jackson is worn out”, the article presents Joseph and his wife as “helpless [elderly] victims” in a “four-year battle” against the government over their land, all of which implies that the government has done something wrong. Yet such an image is quite misleading because as discussed earlier, eminent domain is not inherently illegal nor unjust within the US political system. Such a sentence uses grandiose and verbose images that seem to complete the battle metaphor, yet such an image provides little evidence, better fit for a work of fiction than an informative article. This phrase in and of itself highlights the problem of this article, which is built solely on manipulating rhetoric to support the victimization of this couple as opposed to presenting the realities of the situation, which may or may not lead to the victimization of the couple. Language seems to be both Joe and the author’s greatest tool. Similar to Joe’s sign “Another farm destroyed by progress”, the author uses compelling figurative language to invoke decisive and active images, such as the “violent cloud of dust” that closes in on the reader and the presence of the “heavy” machinery that seems to embody the power imbalance. The second part of the phrase, “cutting through the rolling hills of southern Indiana”, is where the image really takes shape, as the author plays on the innocence of nature and the devise, sharp force of progress that destroys its unequal opponent. This image embodies the position of Joe and his wife. Again, I will not deny that elements of Joe’s story garner sympathy, but the reality is that the story is more fluff than content and produces gross exaggerations. As this article shows, rhetoric is extremely powerful. But the arguments in the article fall flat, beginning with the very amount of land in question. While it is necessary to talk about the human consequences of issues like eminent domain, discourse must be grounded in fact and multiple perspectives as well. The purely emotion driven writing in this article presents unrealistic and one-sided images of a situation, leaving people with simplistic and often times incorrect views on a complex issue such as eminent domain. It may not be illegal, but that does not negate questioning of eminent domain, which should include considering emotional aspects of it. Here, however, emotion comes across as hyperbolic and the only overwhelming perspective. Unfortunately, the structure and content of this article, like so many others in the media at the moment, miss the mark and instead focus more on stimulating, than informing readers.